Interstate 495 overlays the Falmouth Spur, the Maine Turnpike connector between the mainline (Interstate 95) and Interstate 295. The toll road formerly carried I-95 away from the Maine Turnpike to its free route north to Brunswick and Gardiner. There are no exits between the two Interstates, but the east end of the Falmouth Spur does provide access to U.S. 1 in the town of Falmouth. The Falmouth Spur opened as part of the Maine Turnpike in 1955. It was incorporated as part of the Interstate 95 alignment around Portland in 1956.3 The Maine Turnpike main line north from the west end of the spur to Auburn, Lewiston and West Gardiner was unnumbered. With Congress passing a law in 1987 that raised the national speed limit from 55 to 65 miles per hour, the state of Maine sought to include all of the Maine Turnpike into the Interstate system. Since the increased speed limit was allowed only on rural Interstate highways, the turnpike outside of I-95 was not applicable. Approved by AASHTO on December 4, 1987, Interstate 495 was established along 50.47 miles of the toll road from Portland to West Gardiner. The December 31, 2017 Interstate Route Log and Finders List still references the pre-2004 mileage of 50.47. 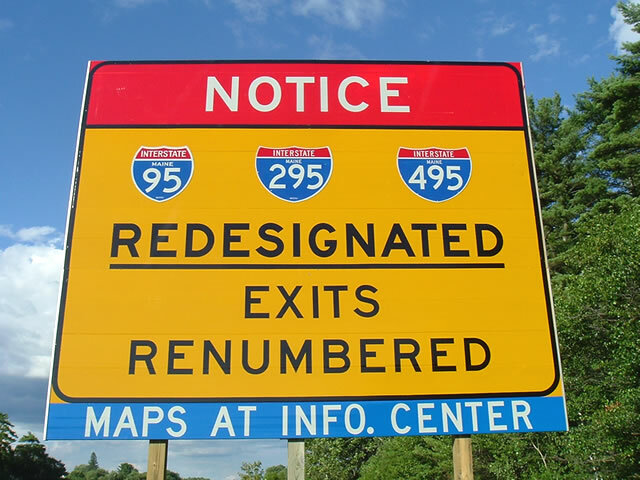 This sign was erected along Interstate 95 (Maine Turnpike) northbound beyond the New Hampshire state line to advise motorists of the redesignation of I-95, I-295, and I-495 and the exit renumbering of the Maine Interstate system. The last signed referenced for I-495 in Maine here was removed by Summer 2007. Photo taken by Sheila Schumacher (08/31/04). U.S. 1 (Blue Star Memorial Highway) north at the westbound on-ramp for the Falmouth Spur, when it was still a part of the Interstate 95 mainline. An I-495 trailblazer referenced the Maine Turnpike north from Portland to Lewiston. Photo taken by Jeff Royston (12/02). The east end of unsigned I-495 sees a loop ramp for Interstate 295 north to Freeport, Brunswick and Bath and a trumpet interchange with adjacent U.S. 1 (Blue Star Memorial Highway) north to Yarmouth and south to Portland. There is no direct access to I-295 south. Instead motorists are directed onto U.S. 1 south and Bucknam Road west to make the connection. Photo taken by Sheila Schumacher (05/20/04). Bucknam Road west links U.S. 1 (Blue Star Memorial Highway) with parallel Interstate 295, just south of its partial interchange with the Falmouth Spur. Bucknam Road and U.S. 1 provide the missing movements between the two Interstates. Photo taken by Sheila Schumacher (05/20/04). U.S. 1 (Blue Star Memorial Highway) north at the trumpet interchange with Interstate 495 (Falmouth Spur) west. 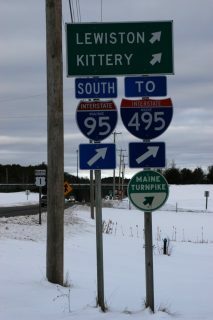 There are no westbound exits between here and I-95 (Maine Turnpike). Photo taken by Sheila Schumacher (05/20/04). Trailblazers for Interstate 95 and the Maine Turnpike take the place of a shield for I-495 west at the on-ramp from U.S. 1 south. Photo taken by Sheila Schumacher (05/20/04). With no direct access between I-295 north and the Falmouth Spur west, a Breezewood style connection requires motorists to use Bucknam Road and U.S. 1 (Blue Star Memorial Highway) north to access unsigned Interstate 495. Photo taken 06/27/05. Entering the folded diamond interchange (Exit 10) with Bucknam Road on Interstate 295 north. Bucknam Road links the freeway with Maine 9 (Middle Road) to the west and U.S. 1 to the east. I-295 next passes under the Falmouth Spur, with only a northbound on-ramp and southbound off-ramp joining the two. Photo taken 06/27/05. Heading south into the town of Falmouth, Interstate 295 runs between Chenery Brook and U.S. 1 (Blue Star Memorial Highway) to forthcoming Exit 11 with the Falmouth Spur. Photo taken 06/27/05. Points South, N.H.-Mass. are used in place of Kittery, Portsmouth, New Hampshire and Boston for the Maine Turnpike control points on Interstate 295 south. Photo taken 06/28/05. 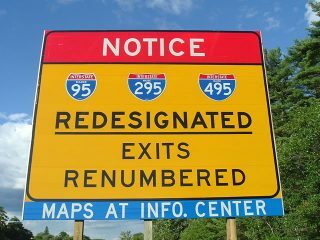 Exit 11 parts ways with Interstate 295 south in one mile for unsigned I-495 (Falmouth Spur) west. I-495 and I-95 provide a bypass around Portland while I-295 continues 6.3 miles south to Downtown. Photo taken 06/27/05. Because there are no off-ramps between I-295 and the Maine Turnpike main line, signs for the Falmouth Spur omit Interstate 495. A similar setup is the tolled Selmon Connector in Tampa, Florida which is unnumbered because it links Interstate 4 and SR 618 without any local exits. This Photo taken 06/27/05. Travelers taking I-495 west to Interstate 95 south will reach Portsmouth, New Hampshire in 59 miles. The succeeding exit along I-295 south departs in one half mile for Bucknam Road and the town of Falmouth. Photo taken 06/27/05. A toll plaza collects fares for both directions of traffic along the Falmouth Spur midway between Interstate 295 and the Presumpscot River. Heading west from the toll collection point, a pair of signs direct motorists into the appropriate lane for Interstate 95 north to Augusta and south to Portland and Kittery. Photo taken 06/27/05. Older signs for the Maine Turnpike referencing I-495 were amended to show I-95, but with three-digit shields to conceal the former designation. Photo taken 06/27/05. Unsigned I-495 west concludes at a trumpet interchange. Interstate 95 southbound travels seven miles to South Portland and 56 miles to Portsmouth, New Hampshire. Leading away from the Portland area, the Maine Turnpike north continues 25 miles to Auburn and 30 miles to Lewiston. Photo taken by Sheila Schumacher (05/20/04). Signs for the Falmouth Spur from Interstate 95 simply reference the connections with I-295 and U.S. 1. When Interstate 495 ended here from the north, it simply transitioned to I-95 south without any fanfare. Photo taken by Sheila Schumacher (05/20/04). Exit 52 departs from Interstate 95 (Maine Turnpike) north for the Falmouth Spur (unsigned I-495). Interstate 495 arcs east across the Presumpscot into the town of Falmouth, connecting the turnpike with I-295 north to Freeport and U.S. 1 north to Yarmouth. Photo taken by Sheila Schumacher (05/20/04). Approaching the former split of Interstate 95 north from the Maine Turnpike main line (I-495) onto the Falmouth Spur east. Photo taken by Gary S. Peterson (02/14/02). What was the first northbound confirming marker for Interstate 495 on the Maine Turnpike main line. Photo taken by Gary S. Peterson (02/14/02). Interstate I-95 Redesignation & Re-numbering Information http://www.state.me.us/mdot/maines-transportation-systems/I-95-redesignation.php, Maine Department of Transportation. “Highway switcheroo slated for I-95, I-495 and I-295.” The Times Record News, December 24, 2003.